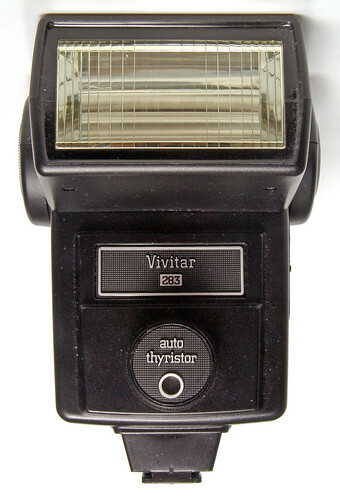 In a world of disposable electronics it is amazing to come across the Vivitar 283 flash unit. 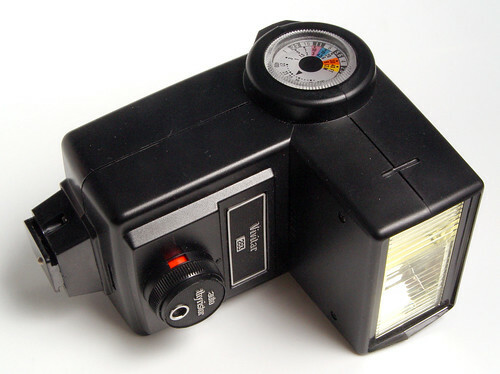 The 283 is the VW bug of flash guns; first released, as far as I can determine, in 1975 it is still being manufactured and used extensively today. During that time it has remained remarkably unchanged (trigger voltage withstanding). Although, when first released it was state of the art with its thyristor circuitry, in today's age of sophisticated TTL, dedicated flash guns it does look somewhat clunky and dated. As its position on the technology food chain of flash guns has slipped its relative price as gone down too. People talk about buying 283s back in the 70s for $70 and that is still their street price today. Back in the 70's pros and newspaper photographers used the 283 extensively. Now they have more options and the 283 might look out of place on a pro's whiz-bang DSLR but that's not to say that the 283 doesn't still have it's uses. Built like a tank the 283 can take all the abuse thrown at it and still work perfectly. I bought two 283s that had been thrown around by a professional for more than a decade for less than $30 shipped from eBay. They came with a few accessories and everything still worked perfectly. I spent an evening removing the residual goo left by years of old gaffer tape and, although they still sport many scars and scratches, there are still many modern applications where they are useful. I use them like portable studio strobes to supplement the single monoblock studio strobe I own. Slaved, diffused and used as background or fill lights they are more than acceptable. Indeed, if I don't want to cart a studio light around they can be mounted to a stand and umbrella and used as the main light source. The 283 is powerful for it's compact size but sometimes its power is over stated. I'm sure its guide number of 110 is a little optimistic. It is powerful enough for most situations and with some understanding of how to setup and use its thyristor settings it is still useful as an on camera flash. Being around so long there are plenty of accessories available for it and its design allows the use of some unusual ones. For example, its thyristor eye unit is removable and a extension cable can be used to but the sensor in the camera's hot shoe while allowing positioning of the flash unit itself in a more flattering off-camera location. There is also a varipower adaptor available which allows more control of the 283's output in manual settings much like a studio light. I also like the quick change battery holder which allows you to change batteries in an instant if you carry a loaded spare. Much has been made of the older 283's trigger voltage. This is voltage you can measure across the contacts in the hot shoe when the flash is primed for use. Reports of older units packing 300 volts or more abound. When cameras where all mechanical this kind of voltage wasn't a problem but used on modern electronic film or digital cameras that kind of voltage may be destructive. Unfortunately ms-information also abounds. There are claims that those "made in Japan" units are the oldest and will have this problem. I have a 283 from the Japan era and it measures less than 10 volts just like my Korean unit. The only way you can be sure is to measure the voltage coming from your own 283 before using it on a modern camera. Even if it does have a high trigger voltage it can still be useful. Attach it to a slave and it is totally removed from your camera and cannot do any damage. The hot shoe on this flash can be its Achilles heal. It is relatively soft compared to the construction of the rest of the camera and will fail if abused. Luckily, it is also simple to repair. Searching eBay will reveal lots of sellers offering replacement parts to fix your flash gun. I got over the high trigger voltage (139v) on the Hanimex PRO 550 with the Wein Safe Sync. I just verified 3 differente 283, one made in Japan the other two in China. I just tested my 285 bought in July 1979, and it is at maximum 7.82V (7.74 to 7.82). Is it safe to use in Canon Rebel digital/300D (not XT)? Even this lower voltage, I was also warned not to use it. Comments? I have just bought a panasonic Lumix FZ20 (great little beastie) and stuck my faithful 1975 vintage Vivitar 283 in its hot shoe - takes brilliant flash photos under just about any conditions. The inbuilt flash on the Lumix is good; in fact, better than most, however the Vivitar on board is unbelievable. But....with a hardware shop multimeter held across the terminals of the Vivitar shoe when its primed and ready, I get a voltage of 263V. The Lumix seems to not have suffered (taken some 20 shots so far) but are there any techs out there who know the truth...? would love to hear it. In the meantime, take care and enjoy a massively useful flash unit. Hi. I just got one 283 from ebay. It is a Korean model and my multimeter reads 8.3V across the terminals. And yes Jean-Jacques, what is important is current (amperage) but amperage is the voltage divided byt the resistence of the circuit to wich the voltage is aplied. The the camera circuits have the same resistence no matter what flash gun you use, the higher the voltage, the higher the current (amperage) too. Regards. 283's and 285's that I already have. Great exposures every time. Inherited one from my father. Will this work on a Nikon F100? Thanks! Waitng for my 283 from an eaby seller. Before I bought it I had heard that it works well on a Fuji Finepix S9500. Any further comments? all the comments are about voltages to and from the hot shoe. I connect my 283 to the camera via a sync cord. Do I have to worry about voltages through the sync cord connection?? Zimmerman - high trigger voltages can damage your camera's electronics when using the pc sync as well as the hotshoe - both are a conduit into the same place in your camera. Just like you can get hotshoe trigger voltage protectors you can get inline ones for the sync cords. I've used a Vivitar 283 along with a Panasonic FZ10 for about 500 shots. Great results, I think. Although unedited, the pix are a little yellow, the other aspects, such as flash power range and adjustability, smart light bouncing, portability w/the extension cable when needed, all make up for any color disappointment. All selection menus seem to be accessible (in b+w vibrating Japanese mind you), but no actual picture image comes through on the lcd or electronic viewfinder at all. Basically I think the camera is probably shot. Disappointing after relatively few frames taken and only 2 yrs. Now I wonder whether it might have been a time accumulation of improper voltage from the Vivitar 283 that caused the problem, planned obsolescence, random misfortune, or other. The shots I took with the 283 were so much better than the built in Panasonic blinder/flash that I'd say it was worth it in any case, even if the Vivitar had anything to do with the FZ10's malfunction. I've fried an FZ-10 with a 283. The onboard flash works, but the hotshoe is dead. Be sure to check voltages, and be careful with them. My made in Japan 283 measures 119 volts with Ni-MH batteries. I understand that Cannon digitals will only handle 5v. Higher voltage may work for a bit but will eventually toast your camera. Have a Vivitar 283 from 1977, never used. Can it be used on an Olympus E-volt digital camera? I learned the magic of auxillary flash with a 283 and wein slave. Now I'm up to four of them! Question is why my Nikon D50 will trigger the remote flash but the light seems to have no effect in the picture. Some suggest taking the camera flash off red-eye but that doesn't do it either. Dawn - you have to measure the trigger voltage to make sure it's safe - ask on a E-volt forum and someone more familiar with your camera than I am will have a definitive answer for you. Sonia - what's your shutter speed? The Nikon internal flash will probably sync at much higher speeds than the the 283. Try slowing the shutter speed down to 1/60th and see if that makes any difference. If that works, gradually dial up the shutter speed until you don't see the light from the 283. One stop below this cut off point will be your maximum sync speed for the 283 off camera. Let me know if this helps. Where exactly do you measure the voltage on the 283? There is only one contact on the shoe. The battery pack will go in one way -- you can't put it in backwards. You measure the voltage at the pin on the bottom and on a contact in the shoe groove. I measured 230V on my (Japan) flash. It works OK on my Rebel XT, but this is more juice than I would prefer to use. I'll look into a safe sync device. A friend loaned me their 283 to use for a shoot coming up, and I COULD NOT BELIEVE that they still make this unit. I can remember coveting it as a student with an SRT-202 back in the late 70's!!! Thanks for writing this up! Anyone heard of a quantum battery 1 pack??? Will a wein safe sync via a (common)pc hot shoe adapter be a sufficient and safe remedy using a vivitar 283 off camera in manual mode with a canon xti? Also, do I need a special pc hot shoe to safeguard against voltage problems or only the safe sync? A detailed reply is appreciated. I just got a new Canon EOS digital Rbel XTI and was about to hook up my old Vivitar 283 when i wanted to check something in the manual and couldn't find it so I came to the web and found your article. Now I am concerned about trying to mount it on my new camera. Any ideas? CJ - the external battery pack shouldn't affect the trigger voltage. As for the safe sync - as long as it is directly inline between the camera and the XTi's hot shoe you should be safe. You shouldn't need any further adapter but the safe sync. Nikons usually emit two flashes...one for metering, and the second to actually expose the frame. The first flash is triggering your slave, and so when the main flash fires the 283 is already spent and is recycling. Find the menu settings for your flash, and change it from 'TTL' to 'Manual'; then you can play with it and set the power accordingly. This will eliminate the pre-flashes and give just one flash burst which will be in sync with your slave. I find the whole flash thing overwhelming to say the least. I don't understand the damage that the 283 can cause to modern day digi cams? I have found several online for cheap. But don't want to damage my camera, however I probably won't shoot it from the hot shoe. What do you make of the 365 zoom? Well, it seems that the voltage numbers vary greatly between years and place of manufacture. This got me a little worried as I have been playing around with my new camera and my old flash. I inherited a Vivitar 283 from my brother, probably bought used in the late 80's or early 90's, made in Japan, serial #30811**. I tested it using a Radio Shack Digital Multimeter (22-163) and got a voltage range of ~8.03-9.23 volts. I just received a Nikon D80 for my birthday and the manual states on page 119 (English US version); "Negative voltages or voltages over 250 V applied to the accessory shoe should not only prevent normal operation, but damage sync circuitry of the camera flash." I assume, because of the lack of clarity, that the D80 has a hot-shoe rated up to 250V and my old Vivitar Flash Unit, because it seems to be rated at less than 10V, should work just fine. Does anyone have a definite answer? I would hate to have to purchase a new flash unit when I have a perfectly good one. The problem with the trigger voltage is that it didn't really matter when cameras were mechanical. When the flash was trigger it mechanically closed the circuit and it didn't matter if huge voltages flowed through the camera's inners. Microchips and delicate modern circuits are a whole different ball of wax. The safest thing to do is to buy a modern flash designed specifically for your camera - we just got the Canon Speedlite 430EX - it's a little bit more than an old flash but is very powerful and does a lot of the exposure calculations for you. The old flashes are still useful when you want to build a cheap, portable studio lighting rig - check out Strobist at http://www.strobist.blogspot.com/ for lots of ideas and suggestions. I have a Nikon D50 and a 283 with a trigger voltage similar to yours. Mine (and yours) are both within the tolerances specified by Nikon, and I have successfully used mine in over 1000 photos. I am looking at buying a 283 for my E-3. Will they fire via infrared? Thank you. given a 283 recently...put in new batteries, but not getting any power response...could the flash tube be cracked or would there be some other reason? is it just trash? thanks. my flash has stopped working and i have changed the batteries... any ideas why its still not working??? I've got a 283 somewhere that goes back 25 years to when I did photography at college. Would love to figure out how to make it work with my Finepix digital camera. Memory lane ... ! My current thinking is that many (most?) optical slave triggers will work fine because they can tolerate the high voltage. Wein "peanut" slaves are frequently mentioned; there are also "preflash" versions that allow for the preflashing of modern flash units. My Viv 283 could also be used as the master/only flash, by using a voltage-regulating device. Wein makes a line of "safe-sync" items that deal with this, and others probably do also. However, this provides _only_ the functionality that we had back in 1975. My Canon XSi has lotsa nifty features that the older flash simply doesn't support. So I'm inclined to get a modern flash (I just ordered a 430Ex II) as the primary flash, and use my old much-loved 283 as a slave/fill-in. I have 2 285s, and both have recently been firing on their own. One works fine for the first roll or two then starts firing on its own -- even when I turn it off and take the battery pack out. I've used both for a year without any problems. I was using the short spiral sync cord that came with the flash along with a 15' extension. The spiral cord has a pin-type plug that plugs into a port at the bottom of the flash. 2 months ago, the sync cord pin was no longer making consistent contact. So I started using an adapter that slides onto the hotshoe and has 1 female and 2 male ports. That allowed me to use only the 15' sync cord and bypass the pin port. Is this adapter screwing with the circuitry? I'm using rechargable AA batteries and plugging into a Mamiya 7II, always off-camera. But I've been doing all this since day one without problems. The adapter is the only new thing. Any ideas??? Thanks. I just picked up a working 283 at a PA thrft shop for $2.92. 2.92 !!! there was no battery pack, so I had to foil tape the battery cover in 2 strips to make the contact. Ta daaa! I fired it successfully with a Nikon D2X.